6 Seek the LORD and live, or he will break out against the house of Joseph like fire, and it will devour Bethel, with no one to quench it. 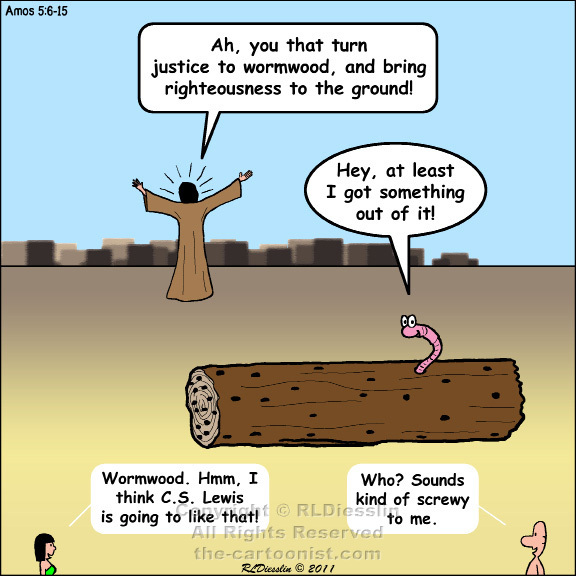 7 Ah, you that turn justice to wormwood, and bring righteousness to the ground! [...] 10 They hate the one who reproves in the gate, and they abhor the one who speaks the truth. 11 Therefore because you trample on the poor and take from them levies of grain, you have built houses of hewn stone, but you shall not live in them; you have planted pleasant vineyards, but you shall not drink their wine. 12 For I know how many are your transgressions, and how great are your sins-- you who afflict the righteous, who take a bribe, and push aside the needy in the gate. 13 Therefore the prudent will keep silent in such a time; for it is an evil time. 14 Seek good and not evil, that you may live; and so the LORD, the God of hosts, will be with you, just as you have said. 15 Hate evil and love good, and establish justice in the gate; it may be that the LORD, the God of hosts, will be gracious to the remnant of Joseph. Amos is a prophet to Israel (the Northern kingdom) in the time prior to the Assyrian takeover and his main concern seems to be internal social justice. The book is a loose collection of oracles with no particular order or flow to it. In this passage Amos is clearly calling Israel to social justice. Hopefully by protecting the weak and helping the downtrodden (and not taking advantage of them) that will keep them in God's favor. Even worms get their day.